You can see from the pictures in our gallery that Fairview is a traditional stone-built house. While it has been modernised to meet the needs of today's visitors, the style of the original building has been retained, where possible, to fit into the landscape and help you to feel truly at home in these wonderful islands. The previous owner of Fairview, a skilled craftswoman with deep Shetland roots, collected a number of older ornaments and other pieces and some of these are still on display. In her view, these were reminders of times gone by when many Shetlanders were seafarers and would perhaps return home with treasures from south or abroad. These would have been loved and prized possessions for a Shetland family. 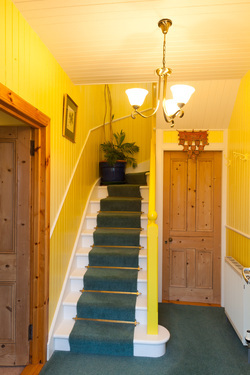 The feature of a glazed porch has been a very usual addition to Shetland homes for many years. It helps to keep homes cozy on windy days and in Fairview, because of its orientation, it's a great place to relax and enjoy the view on a sunny day.